The Congressional Budget Office made a liar out of Donald Trump with one simple graph. Donald Trump has been caught in a new lie. Yes, another one. This time it's about just how deep and bad the cuts to Medicaid will be if the Republicans pass their dangerous bill to repeal health care to give more than $500 billion in tax cuts to the rich. When the Congressional Budget Office released its first report earlier this week, it was incredibly damning. So damning, in fact, that Senate Majority Leader Mitch McConnell was forced to delay the vote on the bill until he can bribe enough Republicans to fall in line. In the mean time, though, Trump is flat-out lying about how bad the bill is. Trump's graph is total nonsense, as every actual expert has already pointed out. Someone showed him a meaningless graph that does not take into account a number of factors, and he insisted on tweeting it, according to a source in the White House. 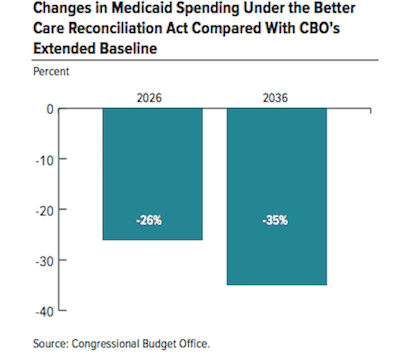 But now the CBO has weighed in with its own graph, included in a supplemental report on the bill's long-term affects on Medicaid. You don't have to be a genius to see that the Medicaid spending drops significantly in the first 10 years alone, and even more in the next 10. The new report makes clear how drastic the effects of this bill would be on the millions of Americans — one in five — who rely on Medicaid. Under this legislation, after the next decade, states would continue to need to arrive at more efficient methods for delivering services (to the extent feasible) and to decide whether to commit more of their own resources, cut payments to health care providers and health plans, eliminate optional services, restrict eligibility for enrollment, or adopt some combination of those approaches. Cutting services and restricting eligibility does not, as Republicans have insisted, make health care in America better. It makes it much, much worse. People will suffer. People will die. Those are the facts, no matter what Trump tweets. Previous articleSarah Huckabee Sanders outright lies: Trump has never "promoted or encouraged violence"